Before you grab your toolbox and start making DIY repairs around the house -- stop. You need to see these home maintenance & remodeling ideas from fellow homeowners first! In addition to time- and money-saving home renovation ideas, this is where we're talking about 'optional items' that you might want to add to the house before or after you move in -- including home decor. See step-by-step instructions for all kinds of DIY home repairs, cool tools that would be nice to have when remodeling a home, reviews of clever new home gadgets, and interior & exterior home decorating ideas. Need A Spring Cleaning Checklist To Keep On Track? A Spring cleaning guide and checklist to help keep you on track to a cleaner and healthier home. If you are remodeling your bathroom or just considering a new toilet, have you looked into the elongated toilet seat option available now? Comfort width (extra wide) toilet seats are ready and waiting. Here’s some very helpful information when choosing toilet seat sizes that are right for you and your home. Zink is one of the latest, greatest techno-gadgets to arrive on the scene. 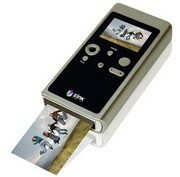 Portable, affordable and sleek looks will certainly propel sales of this ink cartridge-less, hi-res portable digital photo printer. Dachshund boot scrapers will bring a smile to your face every time. Funny home videos involving ambitious DIYers – like guys fixing roofs in a Bud Light commercial and a poor soul in a port-a-potty mishap on a construction site. This Beatles-Yellow Submarine nursery theme is unusual to say the least, but it is also one of the coolest and most unique nurseries that you’ll ever lay your eyes upon. Lots of fun ideas can be found in the world of Pepperland. Why buy a natural gas stove versus electric? I have a few different reasons why we went with natural gas and my reasons just may surprise you. I’ve provided Iinks to some great sites to help you make your decision. Gas or Electric? Which brand to choose? You may have many questions to be answered before you decide. 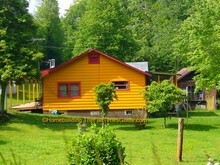 Never paint your house any of these colors unless you want plenty of attention for all of the wrong reasons! Need some storage space. Look no further than your garage for ways to keep your stuff organized or maybe you just need to get the garage organized to get your cars back into them. All the tools you need to sell your home yourself or working with an agent. You have a big job ahead of you if you’re considering selling your home on your own. You have 3 options to choose from; sell it yourself, work with a discount broker and do some of the legwork yourself or go with a full-service real estate agent. Whatever home selling method you choose, you need to know the ins-and-outs of what is involved in this complicated procedure. News Flash! 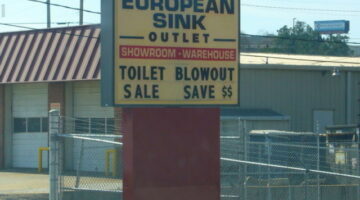 Toilet Blowout Sale! This is a short entry regarding the European Sink Atlanta sign that is humorous and possibly disturbing, depending on your point of view and mood. Please enter with caution! This post covers a recently renovated 3 BR/1 BA brick ranch style home, circa 1966, in Aiken, SC. My parents have owned it as a rental property and have decided to put it up for sale after a lengthy list of renovation upgrades were completed. They spent about a year (here and there) renovating the home to maximize their appraisal value. It seems to have worked! Check it out!